History of the waterworks industry | Pražská vodohospodářská společnost a.s.
Technical works, which conducted water to the needy areas can be traced back to the 12th century in the Prague agglomeration. Supply conduits, whether open troughs or water mains, were made of various materials (wood, stone, burnt clay, lead). These works had gravity feed, without pumping equipment. In the beginning, water pipelines for the church or royal buildings were entirely private, not serving the public. The first equipment entirely serving the municipality was the mid-14th century New Town water pipeline. The founder of the Strahov Monastery was the Olomouc bishop Jindřich Zdík. He chose a spot on the Petřín hillside near Prague Castle and villages along an important trading route. It also had rich sources of drinkable water from the Petřín hillside. One of the remarkable features of this monastery is a complicated and technically interesting water conduit designed even before starting construction of the monastery and built together with it. The water was conducted by gravity feed from rich sources captured in a water gallery on the eastern slope of Petřín. It was distributed by several channels to the monastery buildings and a fountain. From there, it flowed into a carved reservoir and to a large trapezoidal pool in the cloister. This Roman water conduit served Strahov until the end of the 16th century. A large-scale reconstruction of the monastery, which was initiated by Abbot Lohel, also involved reconstruction of the water supply. The springs were cleared and repaired and conducted into a new water gallery and another gallery called the Zahradnická gallery was constructed. The work was finished in 1651. Although the water conduit was constantly extended, it could not secure a steady supply of water. stribution conduit and quickly implemented his projects. The Strahov water conduit still supplies the monastery with non-potable water; it was connected to potable water of the Prague water mains in 1906. Another one of the oldest supply conduits in Prague is the Vyšehrad water supply system. According to more or less trustworthy literature, the water flowed to Vyšehrad through an open trough from a spring known as Libuše's bath in the legends in Jezerka above the village of Michle as early as the start of the 12th century. After 1140, the Bohemian prince Vladislaus II had the open trough piped in wooden conduits and built a fountain at Vyšehrad. What is known, however, is that in 1361, the Vyšehrad chapter under the leadership of Vilém of Lestkov decided to reconstruct the dilapidated wooden conduit and lay tubes of rubbed stone. The new water conduit supplied Vyšehrad as well as vineyards above Podolí. It is not clear when this waterwork vanished, but it still worked in 1441. In September 1333, ... a Zbraslav water supply conduit with lead pipes was completed at great effort and expense. The water collected from three sources was conducted to a lavatory from where it flowed out; the total length from the first spring is two thousand six hundred cubits of the Prague unit of measurement. Two hundred quintals of lead and ten quintals of tin were used in the construction. The cost amounted to one hundred and sixty threescore Prague groschen and twenty threescore groschen were spent on the lavatory with the aid of God, who is blessed for ever and ever. Amen. Unfortunately, this is the only record on establishment of a water conduit for the Zbraslav Monastery. The configuration of the surrounding terrain suggests that springs on the Havlín hillside were captured and conducted to the monastery. Lead as a piping material was used for the first time on our territory. It is not clear when this waterwork vanished. From time immemorial, the Prague Castle was supplied only from the local wells and springs. These, however, became insufficient with the rising demands of the court, so the nobles started to search for new potentials. It seems that the first source came from the Brusnice stream basin. The stream springs to the surface in the Benedictine Monastery of St Margaret, which is located only four kilometres from the Castle. Its source, a spring later called Vojtěžka, appeared in a legend according to which the Slavník bishop Adalbert (Vojtěch) had a meeting with the Přemyslid prince Boleslav II that led to establishment of the local monastery in 993. The stream flowed below the Střešovice hillock, through a gorge, which made a natural northern boundary of the Prague Castle, and then into the Vltava River. Springs in the north, i.e. the Střešovice highland and the south, i.e. the Malovanka homestead, were captured in an open reservoir below Kajetánka probably under the rule of Charles IV and from there, the water was conducted to the Castle by a wooden conduit. The Brusnice stream was also conducted to the reservoir. The exact route of the water conduit is unknown, but we do know that in the final section, the water flowed through the moat to the Castle where it ran into a fountain in front of the Old Royal Palace. The Singing Fountain in Queen Anne's Belvedere at Prague Castle. With the arrival of the Habsburgs in 1526, the Prague court was modified and extended northwards, beyond Jelení Příkop (the Deer's Dike). The Renaissance garden was established here. Consumption of potable as well as non-potable water increased with the more frequent stays of the royal family at the Prague Castle. Thus, a search for new springs on the northern slope of the Střešovice highland was initiated. The first conduit from water galleries in the Střešovice and Veleslavín area was built under the rule of Emperor Ferdinand I. Under Rudolf II, the Castle became a centre of politics not only for the Kingdom of Bohemia, but also for the Holy Roman Empire for almost thirty years. This situation increased demands for water consumption. The solution was found in establishment of a new water conduit for non-potable water from ponds near the villages of Chýně and Hostivice, about 13 kilometres away, through the so-called Royal Reservoir (today's Libocký Pond). From there, the water was conducted in an open ditch. The author of the concept was allegedly the famous Danish astronomer Tycho Brahe. The ditch passed along the hillside through Vokovice, Veleslavín and Střešovice to a storage pond in Bažantnice on the castle territory. From there, the water was distributed by a wooden conduit. 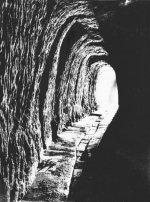 The potable water flowed through a burnt clay pipeline from the mentioned water galleries. Prague Castle was supplied with water in this concept until the 1920s. A grand-scale reconstruction of Prague Castle into a presidential seat was calculated with a new water supply system. The non-potable storage ponds were reconstructed and the water was newly conducted to the Castle by a 300 mm pipeline; the catchment galleries were cleared and thus obtained potable water was conducted by a 150 mm water main to a new water tank, which was also used for non-potable water. Each type of water had its own section. The Castle compound received newly built water-supply piping. In the 50s, the Castle was connected to the municipal water supply system, but the non-potable water is still flowing into its gardens. The mid-14th century is regarded as the time of the onset of supplying the capital's citizens with water from a public water supply system. Together with emergence of the New Town, a new wooden spring-water conduit was laid for fountains at the Cattle Market and Horse Market ... (today's Wenceslas Square) in 1348 ... as we learn from the 19th century literature. However, reliable written documents directly determining establishment of this water supply system are missing. The only tangible proof is an archaeological finding of remains of a wooden conduit in the centre of Wenceslas Square. The Renaissance period symbolized a true rebirth for water distribution. The first waterworks were constructed, the water management system became stabilized and the piping technique and water offtake in public or private fountains was established. 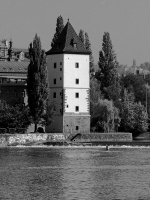 Four Vltava waterworks were gradually established in the towns of Prague over the 15th and 16th centuries. The Staroměstská waterworks for the Old Town, the Petržilkovská waterworks for the Little Quarter and the Šítkovská and Novomlýnská waterworks for the New Town. The newly-emerged method of water supply served with small variations almost until the end of the 19th century. and was repaired under supervision of the stonecutter Giovanni Battista Spinetti. It was damaged by floods (in 1655 and 1752), a fire (in 1762) and Prussian gunfire (in 1756) and, after necessary repairs, it burned down during Windischgrätz's gunfire from Petřín together with the Old Town mills on 16th June 1848. The fire damaged the top storeys of the tower and the top storey received neogothic panelling in 1853. Its current form is a result of fourteen structural modifications and repairs. The equipment of the Staroměstská waterworks was first mentioned in 1636 when it was repaired with wooden and lead pipelines and a new tank was installed after a fire. In 1680, the waterworks was equipped with a new pumping engine. On 23rd November 1697, a contract was signed between the Old Town officials and Václav Nigrin ... for casting two large iron cranks for the waterworks according to models and at least two large tanks. In the mid-18th century, Josef Mysliveček (later called Il divino Boemo) built a hydraulic model of the Staroměstská waterworks as his masterpiece and became a miller master. In 1784, when a weir on the Vltava River burst, the waterworks stopped working for some time because of a lack of water. According to a description from 1808, the waterworks had three pumping engines with three or four points (eleven in total) from 158 to 224 mm in diameter. The water was discharged by a pipeline from 59 to 66 mm in diameter into a 2.28 m3 tub in the tower and then it was conducted by five 59 to 66 mm pipelines to the town. Josef Božek, a machine specialist at Stavovská Polytechnic, constructed new waterworks engines in 1835 according to a design by the Polytechnic director František Josef Gerstner. The machine room was again reconstructed around 1860 when new horizontal pumps were installed. They worked until 1882. These machines were probably designed by Romuald Božek. In 1880, the tower of the Staroměstská waterworks was put out of operation and the water engines were used for supplying a new waterworks in Karlov with river water. This waterworks operated until 24th May 1913. The first reference to laying wooden tubes connected by iron brackets on the Prague territory comes from 1489. The tubes were drilled in raw pine trunks and laid in a sand bed about one and a half metres underground. This technique was used in all towns of Prague until the mid-19th century when the wooden tubes were replaced with lead piping. According to plans of the water supply system from the second half of the 17th century, the Staroměstská waterworks used three main pipelines to supply 96 public or private fountains, and 108 fountains in 1727. Following a reconstruction of the water supply system in the early 19th century, water was supplied directly to the houses. The first construction of the New Town Štítkovská waterworks started in 1495. It was built of wood and before long ... in the summer of 1501, on the advent of Thursday night before St Andrew, the New Town lords' tower, which conducted water in pipelines to the people, burnt down due to negligence of Matouš, the New Town lords' pipe fitter. Two years later, ... in 1503, on the Saturday following Easter in the morning, the tower of the New Town lords that stood below Zderaz collapsed ... and they built another, plaited tower, which, however, stood only briefly, because the piping master ... set fire to it through his negligence and the tower burnt down. Then, they collected money among themselves and built a new tower. In 1588, the waterworks burnt down again and, in the same year, construction of a new tower, which is still standing, was started. Construction of the water tower and the mills started on 8th October 1588. Its builder, the New Town citizen Karel Mělnický, was ennobled for the construction with the predicate of Karlsperk. The waterworks section was completed in 1591, the entire compound in 1599. All building and financial data were recorded in a building diary, which is deposited in the Strahov library of the Premonstratensian order. This is why we know almost all of the details about this construction. In 1648, the Swedes damaged the Štítkovská waterworks by gunfire. The repair work took until 1651, which is documented by signs on the western wall of the tower. Then, it received its characteristic dome. In 1881, the tower was to be disassembled after the end of its operation, but it remained intact thanks to intervention of Umělecká beseda (the Art Organization). Later, in 1926, the tower and the adjoining mills were purchased by the Mánes Union of Fine Arts. The mills were demolished and the tower was incorporated into the Mánes building by the architect Otakar Novotný. Information on the development of the equipment in the waterworks and its distribution system is scarce. In 1495, ...the New Town lords laid water pipelines from the municipal mills and built two fountains; one at the White Lion opposite Obecní dvůr (Vodičkova Street) and the other in Žitná, opposite Krupná Street. In 1605, representatives of the New Town in Prague asked the Kutná Hora mint master for donation or sale of copper for a new tank and crank. In 1610, water from the Štitkovská waterworks was conducted to twelve breweries, two cloisters and municipal as well as private fountains. In total, it supplied water to 130 stands and fountains in the upper part of New Town. On 16th March, the imperial bell founder in Prague Niklas Löv from Široká Street obliged himself to the New Town town hall to cast pistons and other parts for the recently repaired water tower and deliver them in order. At the start of the 19th century, the waterworks had two engines, each composed of four single-acting pumps. The water was discharged by two 66 mm pipes into a 1.71 m3 basin located 36 m higher; from there, it was distributed by six pipes from 79 to 112 mm in diameter to 104 fountains in the upper New Town. 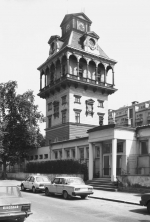 In 1882, the waterworks except the tower was demolished and a new waterworks was built in its place. Two horizontal double-acting Girard pumps powered a Sagebien water wheel, pushing the water directly to the water supply system and the new Karlov water tank. This waterworks was in operation until 24th May 1913. In the Little Quarter, conditions for water supply from the Vltava River were bad. Thus, the Little Quarter representatives made an agreement with the baker Jan Petržilka about construction of a waterworks in the immediate vicinity of his mill on an island by today's Smíchov embankment. The wooden waterworks was located outside the Little Quarter wall, an unusual, but the only feasible solution, on the same weir that served the opposite Štítkovská waterworks. The construction of the brick tower in this place is dated between 1582 and 1596; the upper limit is determined by a dated drawing by Petr Stevens where the tower is presented in a shape as we know it today. The development of the Petržilkovská waterworks can be traced back to 1602 when the statutory millers testified that the machinery was very accomplished. 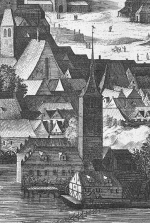 In 1629, a new engine was built with the support of Albrecht von Wallenstein under the condition that water to his palace in the Little Quarter would be supplied free of charge. It is interesting that water for the Wallenstein Palace was still supplied free of charge in the 1920s. In 1670, five wooden pipelines ran from this waterworks basin. The same number of pipelines supplied 57 fountains and stands in 1686. In the early 19th century, the waterworks had two engines, each with three 158 to 191 mm cylinders, which discharged water by two 66 mm pipes to the height of 29 metres, where a 1.05 m3 tank was located. The water was distributed by four 66 mm pipes to the 29-metre-tall tower, where a 1.05 m3 tank was located. 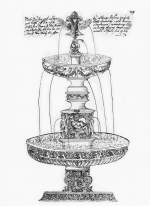 Then the water was distributed by four pipes 66 mm in diameter to forty fountains. In 1840, the Romuald Božek Company built the third engine with two double-acting pumps. Forty years later, the tank was removed from the tower and the waterworks stopped working in 1886. The distribution system of the Little Quarter Petržilkovská waterworks was connected to a new pipeline, which conducted water from a new steam waterworks in Podolí. water, but now, because of the Vltava River's regulation, it is located on the edge of the former Petrská quarter. The water tower had already stood there in 1484, but it was not until 1500 that the New Town council decided to build a water supply system. In 1536, a wooden tower was built and served until the 1580s. After a fire in 1582, it was restored on 10th August of the same year. A report written by senior statutory provincial millers on 25th April 1602 comments on dilapidation of the building. A new, very impressive tower grew there between 1602 and 1606, built of stone, on oak piles in "Renaissance dimensions". It had eight storeys, the top in the form of a gazebo with twelve windows adorned by murals depicting Bohemian kings from Přemyslid to Rudolph II. On 6th February 1655, this tower was ruptured ... by a large flood with ice blocks and timber and then cracked into two parts. 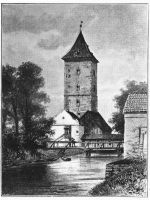 In 1658, a tower, which is still standing, was built. Lessons from many fires did their job, so this youngest Prague water tower was built with "hot-air heating", where the discharge and feed pipes were located in the "chimney". entions a working engine bearing the date 1649. In 1808, the waterworks had two water wheels with two pumping engines, each with four single-action pumps, which discharged water through two 66 mm pipes into a 0.86 m3 basin located 33.5 m higher. Four distribution pipes 92 mm in diameter conducted water to 56 fountains in the lower part of New Town. Between 1877 and 1878, the existing tower was left standing and a new waterworks was built next to it. Four double-acting Girard pumps delivered by První česko-moravská továrna na stroje pumped water through two Sagebien wheels with the power of 70 to 80 HP to the water supply system of the lower New Town and Letná. The reconstructed waterworks was in operation until 2nd December 1919.
hygiene. Nonetheless, cast-iron water pipelines were gradually laid in the streets immediately after 1830, while the fountains and other extraction points had to wait for their restoration until the 60s. In the 50s, the distribution system of the four Vltava waterworks was supplemented with the steam Žofín waterworks with the performance of 950 m3 per day. A commission established in 1871 for "inspection of the Prague waters" had the existing waterworks inspected by 1875. According to a survey, five Prague waterworks on the Old Town, New Town and Little Quarter territory delivered water to about 500 extraction points and about 10,000 m3 of raw Vltava water per day. According to the commission's opinion, however, this was not sufficient for the 160,000 people living in inner Prague. The Vltava waterworks were reconstructed in the 1880s to increase the performance and partly the water quality. The fundamental change involved construction of the Podolí waterworks together with a new distribution system. This steam powered waterworks was built in 1885 and pumped naturally filtered underground water from three wells bored on Schwarzenberg island, mixed with the Vltava water. Four pumping aggregates pumped the water through a discharge pipeline 500 mm in diameter to the newly constructed Karlov tanks in the amount of ca. 15,000 m3 per day. This modification increased the supply for inner Prague to approximately 30,000 m3 of water per day. The length of the entire reconstructed water supply network in this agglomeration is about 400 kilometres. We need to say, however, that even the described modifications were not progressive or economical. Prague failed to reach an agreement especially with Královské Vinohrady and Smíchov; thus, the Prague waterworks in Podolí was built pointlessly near to the working Vinohradská waterworks in Podolí, which had been built three years earlier. The Little Quarter water supply network could have been for example connected to the Smíchov waterworks without great technical difficulties. Gradually, more local water supply systems were built on various technical levels in the neighbouring municipalities, each under the local administration. For example, the Karlín waterworks was built around 1856, the Hradčany waterworks in 1859 and the Letná little waterworks called the Old Waterworks was built in 1861. There was a very modern Smíchov waterworks at the railway bridge with a water tank in Skalka, which was built between 1871 and 1872, supplemented with a pumping station in Václavka and a water tank in Malvazinky in 1886. Even as the water supply for Prague and its immediate surroundings was solved, the village of Vršovice embarked on construction of an expensive independent water supply system in 1907 with the source in Bráník and a tower tank at Zelená liška in Michle. The distribution systems were not mutually connected until Greater Prague was established in the early 1920s. Since the 1870s, the Prague as well as non-Prague specialists had been occupied with the concept of a quality source of true drinking water. These efforts were guided by a programme adopted by the Council of the City of Prague and approved by a board of the municipal elders on 11th June 1875. A waterworks commission for issues connected with supplies of potable water to Prague was established. Even at that time it was suggested that, in addition to reconstruction of the Vltava sources, it would be necessary to search for a new source that would solve the quantitative and qualitative aspects of water supply for a longer period. Many concepts were submitted, inspected and rejected by the end of the 19th century. For example, Ing. Kraissl's project dated 1875 involved feeding of water from the Sázava River at Kamenný Přívoz; in 1876, a German company for waterworks construction in Frankfurt am Main submitted a project for a waterworks in Braník including supply of the whole Prague agglomeration with water; the building commissioner B. Salbach from Dresden prepared a project of the Podolí waterworks including a new system of pumping stations and water tanks in the same year. In 1877 and 1878, the narrow committee for the spring and underground water researched the areas of Hostivice, Šárka and Kněževes, the right bank of the Elbe River before Mělník, the Berounka mouth, the area of Nové Zámky near Česká Lípa, the environs of Vrutice near Mělník and the Mšec and Rynholec regions. Utilization of a bank meadow on the Jizera and Elbe confluence was also considered. On 18th January 1879, the broad waterworks committee decided to pay increased attention to a region east of Mělník in the Elbe and Jizera river basin. In 1881, the Aird and Mark Company submitted a project on utilization of the aquiferous region of Mělnická and Kropáčova Vrutice created by Ing. Smreker. More studies were finished in the 1890s. A project created by the building commissioner V. Feigl and Ing. Fleisig dated 1890 proposed extension of the Podolí waterworks; a Lahovice-Radotín project dated 1891 prepared by the Municipal Waterworks Office in Prague falls into another sphere and a study produced by the building commissioner K. Kress dated 1896 involves collection of the Vltava water near Štěchovice. In 1899, a project created by Ing. J. Vancl on utilization of the Skochovice - Vrané location was finished. In the same year, an important project by Česká spořitelna, created by Ing. Smreker and Knight Zdeněk von Wessely, was conceived, utilizing the Elbe - Jizera confluence near Káraný. An implementation project on the Káraný water supply system, which cost Česká spořitelna 250,000 guldens, was created, but as a mutual agreement with the town failed, the bank "donated" this project to the Prague mayor. The town representatives gradually rejected all of the studies. Implementation of these mostly technically good projects was prevented by a dubious administrative and political rivalry. The discussion even made it into the newspapers, where the individual camps attacked each other. All of this happened when Prague greatly suffered from a lack of water. Based on a land law of 7th September 1899, the municipalities of the royal capital city of Prague, Karlín, Smíchov, Vinohrady and Žižkov united for construction, maintenance and administration of the joint waterworks and the joint water supply system. The "father of new-time research into underground water" and a Europe-wide specialist Adolf Thiem from Leipzig was entrusted with finishing the Česká spořitelna project. The legal measure thus created conditions for implementation of a technical work of European standard, i.e. the waterworks in Káraný, which was referred to as Společná vodárna (joint waterworks). The significance of the Káraný waterworks for Prague and the suburbs became clear to the whole population during the war. At the time of epidemics and general shortage, when the civilian population lacked food and infectious diseases spread from the front, water from Káraný proved greatly effective. It played a lion's share in ensuring the relatively positive health condition in Prague over this period, as we can read later, in an evaluation of this work's significance. Following extensive analyses and studies, the building commissioner A. Thiem submitted a preliminary project on 14th December 1902. The general concept illustrates the overall layout of the water supply system in the main features. The administration board of the Joint Waterworks organized a survey for specialists in health science, geology, engineering and chemistry so that water supply for Prague could be perfectly solved. The following people were invited: Ing. Josef Bauer, the chief engineer of the city of Plzeň, Dr. Jan Horbaczewski, a university professor in Prague, Ing. V. Hráský, professor at the Czech Polytechnic in Prague, Dr. Gustav Kabrhel, a university professor in Prague, Ing. František Krátký, an engineer in Smíchov, Ing. K. C. Neuman, a chemistry engineer in Královské Vinohrady, Kristián Petrlík, professor of Czech Polytechnic in Prague, Ing. Vil. Plekner, civil engineer in Prague, Antonín Pravda, professor of Czech Polytechnic in Prague, Dr. Bohuslav Rayman, professor of the Czech University in Prague, Dr. Alfred Slavík, professor of Czech Polytechnic in Prague, Dr. J.N.Woldřich, university professor in Prague and Dr. Kraft, director of the city testing station. Except for Dr. Woldřich, all experts considered Adolf Thiem's project feasible and, after minor modifications, they recommended it for implementation. The project proposed utilization of an exceptional area in the vicinity of Káraný with suitable conditions for acquiring the necessary amount of high-quality underground water. The suitability of geological conditions rested largely in interconnection of three important waterworks factors: the area is located on the south edge of Mesozoic and Tertiary sediments of the Czech cretaceous basin. These sediments are covered with Quaternary sandy gravel water-bearing deposits, i.e. a very suitable composition as regards the water supply, and the axis of this area consists of the lower reach of the Jizera River, which empties into the Elbe River in Káraný. In addition, artesian water was present there. Construction of the waterworks in Káraný between 1906 and 1913 was a very demanding and complicated project, because nobody, even in the neighbouring countries, had any experience with this type of construction. Thus, the waterworks complex and the corresponding water supply networks in Prague can be regarded a peak work of its time. on the project. In 1914, 25,990,597 m3 of water... were conducted to Prague and the suburbs; the highest daily amount was 81,358 m3, the lowest was 54,943 m3. The water was always fresh, clear and glittering... Bacteriologically, the Káraný water is perfect. The size of the constructed source and other buildings is apparent from the following contemporary description: Two water tanks in Prague Flora, 14 km of distribution pipeline 475 – 900 mm in diameter in Prague, 23.3 km of discharge pipeline 1,100 mm in diameter, 2 inverted siphons under the Elbe River 1,100 mm in diameter, 1 breather tower, main pumping station in Káraný, administrative and residential building in Káraný, 4 pumping stations, deferrization of artesian water, 3.8 km of siding track, 29 km of feeding pipe 250 - 700 mm in diameter, 16.3 km of drainpipe 700 - 1,200 mm in diameter, 6 inverted siphons under the Jizera 400 - 1,000 mm in diameter, 10 km of breather pipe 100 mm in diameter, 10 collection points, 45 input shafts and 7 shafts on the drainpipe, 651 bore wells, 7 artesian wells, 6 breather towers and other auxiliary facilities and buildings. This construction was first funded by advance payments of the Prague municipality; then, when the building schedule was firmly stipulated and the suburban municipalities resigned on their opposing standpoints, the Joint Waterworks and the participating municipalities took out their own independent loans. The mutual proportion of contributions was determined according to water consumption in the municipalities as follows: the Prague municipality 58.4 %, Karlín 4.0%, Smíchov 8.8 %, Vinohrady 21.7 %, Žižkov 7.1%. In this proportion, each municipality contributed to the common expenses and was entitled to the proportional amount of water. Activation of the Kárané waterworks started an era of the modern Prague water supply system. The emergence of Greater Prague demanded connection of the new Prague locations to higher-quality central sources of potable water and gradual cancellation of the local sources. It also necessitated creation of new water tanks and pumping stations to cover the complicated configuration of the Prague terrain relief on which the new neighbourhoods were established and, of course, led to construction of a new water supply network and reconstruction of the old system. In 1921, the main source of potable water came from the Káraný waterworks, a supplementary source from the Braník waterworks (the former Vršovice waterworks) and the new source from 1929 was the Podolí waterworks. Between 1919 and 1928, the capacity of the Káraný waterworks gradually increased by approximately 90 l/s through boring of 68 new wells. The Benátky, Kochánky, Skorkov, Sojovice and the artesian water-withdrawal flanks were supplemented with the Polabsko and Zahrádky flanks. The first major reconstruction started in 1932 and finished after twelve years. It involved modification of pumping water to Prague; four piston steam pumps were replaced with two centrifugal pumps supplied by the ČKD company. Construction of the second discharge mains for Prague with the diameter of 1,100 mm and building of a bridge over the Jizera River between Káraný and Nový Vestec was also demanding. Between 1941 and 1944, thanks to construction of four artesian wells in Kochánky and 25 wells in Káraný, the potable water sources increased by ca. 50 to 70 l/s. In 1946, after the end of World War II, another reconstruction, which almost continuously followed the first reconstruction, took place. Work on intensification of the Káraný source culminated with finishing of artificial filtration in 1968, when, after filtration on sand filters, the Jizera water was pumped to open soakage tanks situated in an area of sandy gravel sediments. The soaked water enriched natural deposits of underground water through the permeable bottom of the tanks and, artificially filtered, it was collected about 200 m from the inflow area. The former Vršovice waterworks in Braník was gradually connected to the Prague water supply network during the first half of the 20s. The only thing we know about the 1930s reconstruction is the fact that a hall with tanks and active coal and a new deferrization plant for improvement of the filtered water was added and that the steam drive of the pumps was replaced with electric drive. The waterworks served as a supplementary source until the 50s and as a reserve source until the late 60s. The described water sources were not sufficient for the life of Prague, so it was decided to build a new waterworks in place of the Prague waterworks in Podolí. Thus, a new waterworks for filtration of the Vltava water with the maximum output of 35,000 m3 of potable water per day was constructed between 1924 and 1929. The water treatment was based on a multi-level Puech-Chabal filtration system. During the treatment, the water was aerated, filtered three times and purified on slow biological filters. The general project was created by the H. Chabal et Cie. Company in Paris, the implementation project was created by the project office of Waterworks of the Capital City of Prague in collaboration with the Chabal company, attended by Prof. Ing. F. Klokner and Dr. B. Hacar who worked as consultants. The architectonic design was entrusted to Prof. Dr. Antonín Engel. The need for more water in the expanding metropolis was solved by supplementation of equipment for dosage of aluminium sulphate to raw water and subsequent filtration of impurities bound in floccules on the existing slow filters. This equipment was put into operation in 1932. The last step in modifications over this period involved replacement of a three-stage filtration with rapid filters WA-BAG in 1942. It increased the output to ca. 1,000 l/s, but the potentials for intensification were practically exhausted. As prognoses of potable water consumption suggested an enormous increase, it was decided to reconstruct the plant in the 1950s, which meant not only changing the equipment, but also the shape of the Podolí waterworks. The new part, which was built south of the existing objects, was equipped with Binar-Bělský clarifiers, new pumping stations for raw and treated water, storages of chemicals, new laboratories and other objects. The output of the waterworks reached 2,200 l/s. The reconstruction was complicated by the fact that the waterworks could not be completely shut down. Thus, it lasted for almost twenty years. Interestingly, it was designed once again by Antonín Engel together with the project office of Waterworks of the City of Prague. This was the end of further development of the Podolí waterworks for a long 35 years. There were even voices suggesting termination of this water purification plant in connection with construction of the Želivka waterworks. It was not until the late 1980s that keeping it in operation was seriously considered. The obsolete waterworks was threatened with a failure, which would mean a collapse in supplying Prague with water. At long last, a major reconstruction started in 1992. From the creation of Greater Prague until conduction of the Želivka water to Prague, the Prague water supply system was based on three sources, i.e. Káraný, Podolí and Braník. The main reservoir consisted of water tanks in Flora to which the Káraný water was flowing. From there, the potable water was distributed to the whole eastern part of Prague and water tanks in Karlov from which it flowed to the Smíchov water tanks and the newly constructed plant at Bruska. The water from Podolí was conducted there too. From Bruska, the potable water was pumped to the Andělka and Vyhlídka water tanks, which were used for supplying of the north-east part of Prague. The key point for the south part of the city was a waterworks compound at Zelená liška. It received water from Podolí and Braník. After finishing the Podolí waterworks, the Braník source was disconnected. The Želivka waterworks is not only the most modern and largest water purifying plant for our capital, but also the largest waterworks in the Czech Republic and one of the largest waterworks in Europe. It was put into operation in 1972 with the output of 3,000 litres of potable water per second. In 1987, the output was increased to 4,000 l/s. The basic technology in the water purification is direct filtration incorporating destabilization, aggregation and single-stage separation on open rapid sand filters. The raw water is extracted from the Švihlov water-supply reservoir and conducted to a pumping station located at the foot of the dam. Raw water from this station is conducted by discharge mains to three separate water-purification lines. The suspension is prepared on the 1st line by dosage of aluminium sulphate, rapid mixing in a rapid mixer and slow mixing in a flocculation tank. The suspension is conducted to 32 filtration units. On the 2nd and 3rd line, the destabilization is achieved by dosage of aluminium sulphate. It is immediately followed by aggregation, which is ensured by rapid mixing during a flow of a layer of flocculated material. The next process involves separation on open rapid sand filters. Each line has twelve of them, each with the area of 99 m2. After filtration, a pipeline conducts the water from each line to ozonization, where the amount of purified water, its alkalization with dry hydrate and securing with chlorine is measured. From there, the water is conducted to regulation tanks and to a supply conduit. It is over 51,000 metres long, has a diameter of 2,640 mm and is terminated in a water tank compound in Jesenice near Prague. Conduction of water from the Želivka fundamentally changed the method of water transport to the consumers. From the Jesenice reservoirs, Prague was "besieged" from the east and west by feeder pipelines of large diameters and the water enters the inner city from the edges, contrary to the previous transport when the water was conducted to the centre and from there to the suburbs. At present, 65 water tanks, 48 pumping stations and about 3,500 pipelines are used for water distribution in Prague. Photos: archive of Pražské vodovody a kanalizace, a.s.